The Multi-route Embed is a web widget that allows you to place multiple routes in a single view. This is great for sharing your multi-day, multi-route events on your web site or blog. 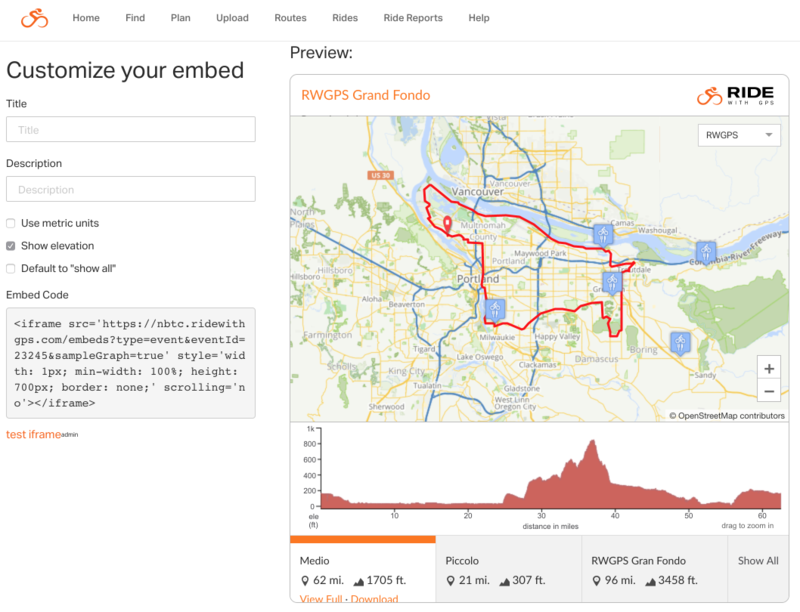 The embed is interactive so you can drag the map around, zoom in, change map types, click on Points of Interest, switch between individual routes, show all the routes at once, and getting linked to the event page. 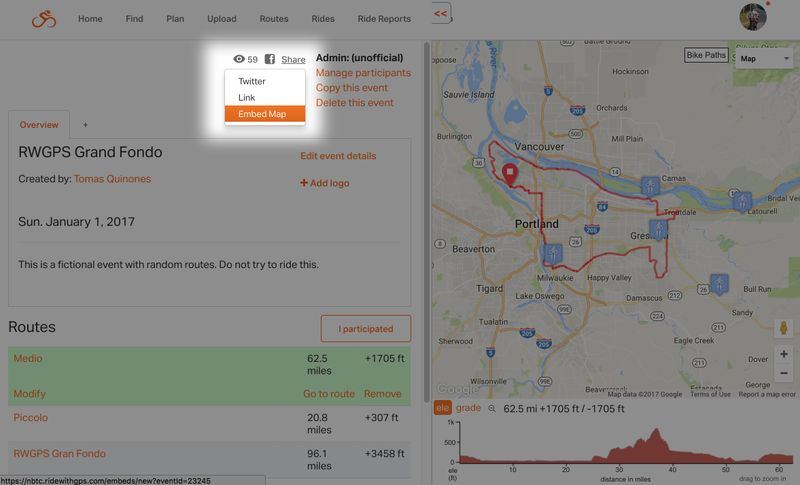 Create an event page and add all the routes you want included. Learn more about creating an event page. After you have added all the routes to the event, click on SHARE at the top sharing options. Select EMBED MAP to be taken to the embed page. You’ll be taken to the page to customize your embed. Allows you to over-ride the name and description already set up in the event. Since you don’t have to be signed into the website to view an embeded route on a website, this will set the distances and elevation profiles to metric values. Enabling this options includes the elevation profile for the individual rides. By default, the elevation profile for the routes is enabled. When you click SHOW ALL, the elevation profile is hidden. It is only shown when you click the name of an individual route. This will show all the rides on the map at once but keep in mind that the more rides/routes that you have the longer this will take to render the web page. Take this into consideration when optimizing the loading speed of your website. Copy the EMBED code by selecting the code and right-click then copy. Paste the EMBED code into your blog post or web page. The event and all routes within the event MUST be set to PUBLIC for the embed to start showing up. Any routes or rides added or removed will start to show up on the embed after you refresh the page. You will not need to update the embed code. WordPress.com users: iFrames are not supported on WordPress.com, you can find workarounds, but if you use the WordPress.org self-hosted blog then you won’t have any issues using iFrames.